Partial innocence roams the school. Lip gloss for a sword and tapping acrylics as a shield, unaware they’re losing an invisible battle. Queen bees, who aren’t sworn to lose their stinger after a sting, swarm butterflies relentlessly. Butterflies, who’ve embraced the cocoon for so long they still aren’t sure how to fly. Their wings become incredibly apparent as they hunch in corners over chapter books. They walk the halls in silence, a large backpack crumpling their locomotion for the moment. The bees disturb the stillness. They push hard through the crowd, pollinating the space with rumors and lies. To the torn queen, school is menial. After doing a tightrope walk on their unbalanced confidence, several pliets for a ballet of never noticing boys, and playing pretend for a barely there family; wouldn’t you be tired too? Masters of displaced emotion, they fling their sadness in the form of security. I’ve seen it land on the shoulders of their worker bees, too conformed to find their own path and too scared to lighten their burden. I witnessed a butterfly fend for her life yesterday, her tears coating a pasta and Styrofoam tray, hornets and wasp followers joining the “Queens” in their obliteration. I waited for her wings to break through her shoulder blades. I waited for her ascent. Instead, she ground her misery into the floor with trembling knees. She clasped her hands in prayer, praying for the lunch gods to come and save her. They did nothing. Nothing, but dwindle near a doorway, miss out on the torment when their heads were turned, and smile every once in a while. 1) Learn to ignore, but never seem wrecked. Fragility is what fuels them. 2) Have a book on you at ALL times, a reason for your calm. 3) Run faster, read further, and raise your hand like a panther, the classroom your cause. Five. Remember that broken things are not always fixed easily. Often, they cannot be fixed at all. Smile at the puppets that dangle behind you, feet always out to trip you, follow the string to their puppeteers. Witness the numerous motivators; see that they have stifled wings just like you. A bully is an insecurity in disguise. Somewhere after puberty, some of us become the imaginary friend. Playing pretend. The “friend” who broke the lamp and spilled the milk forms lies to administrators and staff, “No one is picking on her!” This time we can see you and only you. A torn queen bee shedding her fragments for the world to see. She picks them up one by one hoping no one will notice, but we do. A butterfly drifted past my classroom today, told me of last night’s “Pretty Little Liars” episode and the new book she was reading. She squealed with excitement and fluttered about in her happiness. Moments later the torn queen came to pick up her fragment, I mean makeup test. I asked her first, “What are you reading?” She mumbled the same title that previous girl had. After the makeup test, the two spread their wings in the form of conversation. They compared book titles, gossiped of boys and lockers, and laughed at hearty jokes. 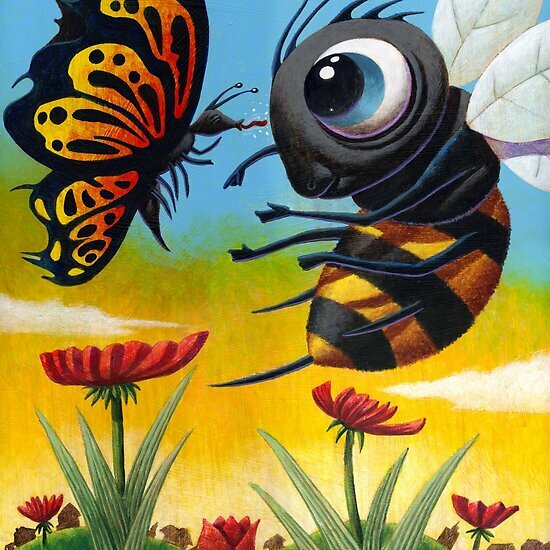 But what is funny, is the sight of a bee and a butterfly roaming the sky at the same level and lightly resting on the same flowers: A world of clouds and sunshine where hierarchy is six feet under and resting peacefully. I am afraid that once the bee leaves my room she will become torn again. I am afraid that the butterfly will resist the temptation to extend her wings. I am afraid they will not have time to just be children. One pulls the lip gloss from her pocket and whips on her bag. The other places a book in front of her face. They’re preparing for war, a war no one will win. WOW. That was so sincere. I respect and admire you from afar your skills with the pen and paper. I am uber-excited to grace your presence one day. That was dope and so full of truth! Being an army brat, I've been on both sides until I learned to be myself and "FOUND" myself somewhere around 7th grade. Some kids don't even make it that far or they never find their place even as adults. Nothing worse that an adult puppet. Beautiful, RIV!!! A very candid observation, told in very beautiful prose. The imagery is just...AMAZING.